This model started it all for me, as it was the first one I got from my parents. 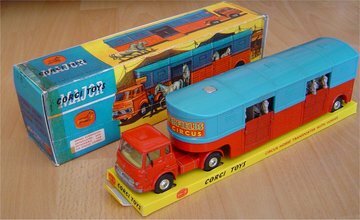 Corgi did a whole range of Chipperfields vehicles. This transporter has the Bedford TK, also used for other combinations. The six plastic horses have gold painted details. There should be three with the front left leg up, and three with the right front leg up. Originally each horse came in a carton holder. The two parts, doors in between, are held together by a big metal rivet in the front, in the rear the lights of the lower part click into the upper part. This one was restored in the original factory colours.